I tend to be a fan of the group break. Especially if it's a new product I don't plan to collect, or if it's older product I missed. I prefer the breaks in the blogsphere, though. The plethora of sites that do box breaks are more about the profit. You can tell from their buy in costs the breakers are making bank. I prefer the best bang for my buck, so I try and get in on breaks when someone runs one, and my pocket book agrees with me. For 2015 flagship, I really had no plans to collect the set. Then somehow I was one of the first to find it in the big box stores, and the damn thing sucked me in. So while I had joined Nacho Grande Chris' case break simply for a couple Sox team sets, I really ended up working towards the set (which is still incomplete - check my want list above). I did fairly well in a break that doesn't feature a lot of White Sox in the insert sets. I can't slip anything by you eagle eyed readers - that's not 2015 Topps. Chris adds in some bonus rips. These were my only hits, but that rated rookie Robin is nice. But on to 2015 product. Plenty of folks hate on buy backs. Well, if you hate them, I will take them - I love the things! My thinking is this: there are serialed cards released in quantities from /1 to /999 or higher. There is no known rate of buy backs. Are there 100 Bahnsens? 263 Lemons with the stamp? Who knows. 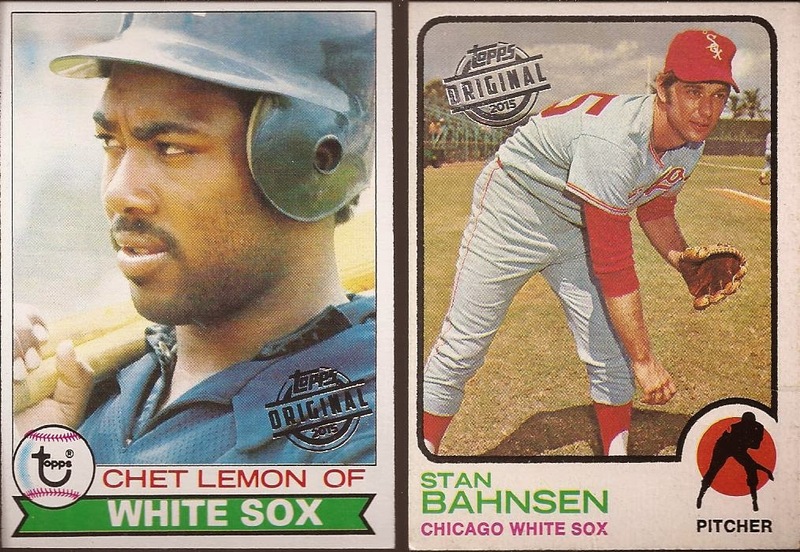 Hell - that Lemon could be a 1/1 - the only '79 buy back of Chet Lemon. To me, buy backs are limited releases, until I hear other wise. Then maybe I'll hate them. 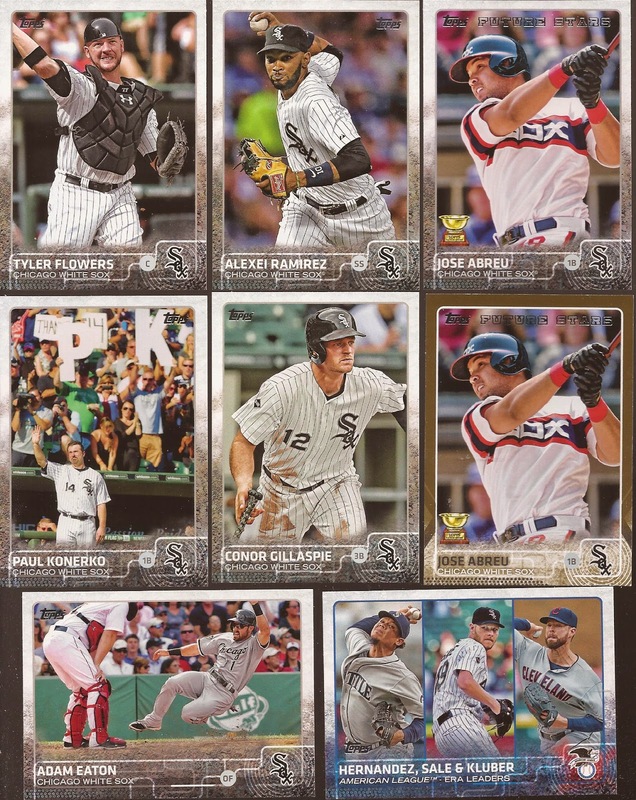 There is your 2015 White Sox team set. 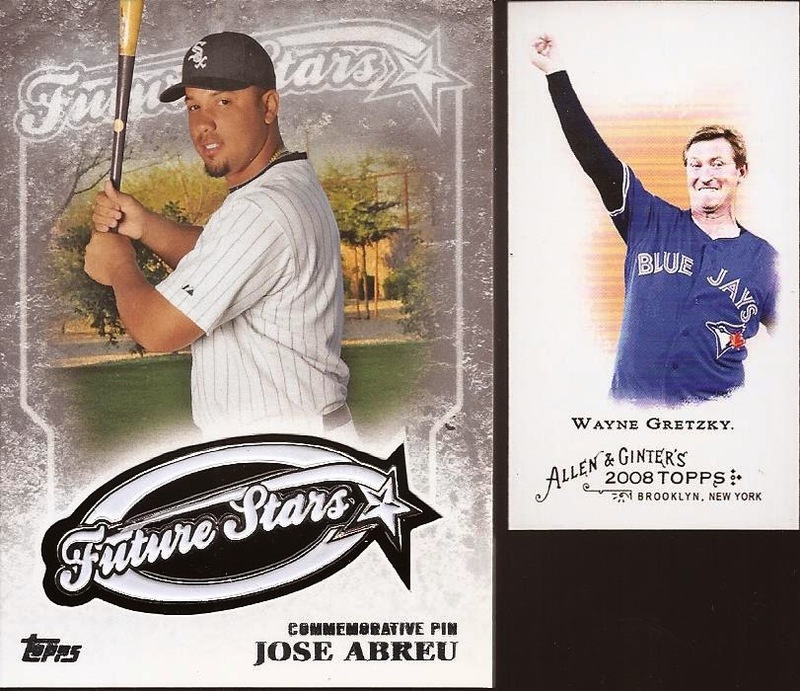 Well, except for the gold Abreu in the middle right. Of the base parallels, the gold was the only one I received. I have been working on a rainbow of the Konerko. It looks good as the first page of the binder. I have the base, foil, black, purple and the image variation. If anyone has access to any of the others, you know where to find me. My big hit of the break, a manufactured pin relic of Abreu. It's a nice addition to the collection and something I wouldn't have chased after unless I came across it really cheap. It was nice to see that pulled from a box. The Gretzky was a card Chris had given away off his blog. It made sense to hold it for the group break mailing. Now, that is all the cards from his case break, but Chris dropped a note in the package. 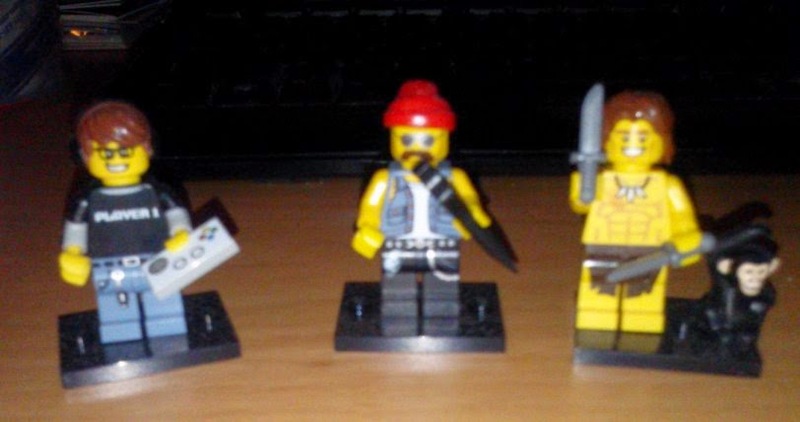 About 6-8 weeks ago or so, Chris and I swapped cards and Legos. I had a figure from the series 12 minifigs he needed (I buy them once in a while) and sent it over to him with an unopened package. I told him to send back anything he wanted in return. Sorry - crappy cell phone image. I mentioned I had the female zookeeper, so Chris thought Tarzan would be a nice compliment. To the left we have a video game player. You can't see the headset he is wearing, so his is probably raging at some "FRICKING CAMPING NOOOOOB!" in COD. In the middle a gruff auto mechanic with a wrench in hand. Though, he kind of looks like one of the bikers from the bar Pee Wee was trying to make the phone call from. Thanks for the break, Chris. Now where's the Heritage?!?!? Glad you liked 'em, I can't wait for Heritage!